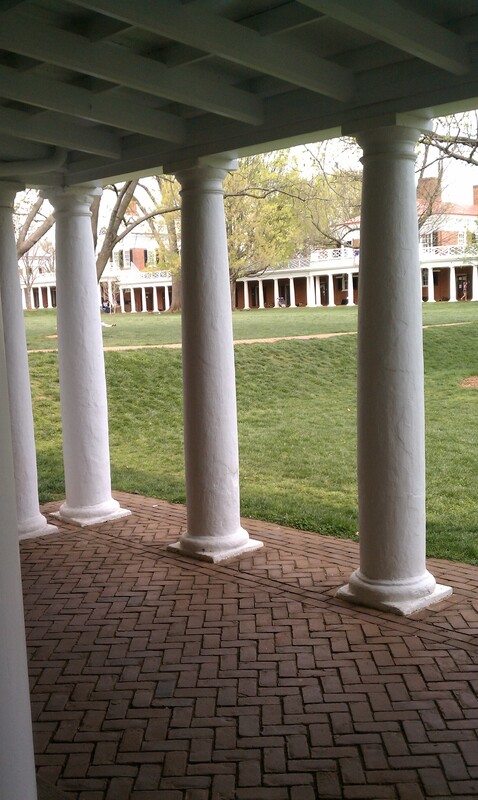 Last spring I went to Monticello and the University of Virginia. 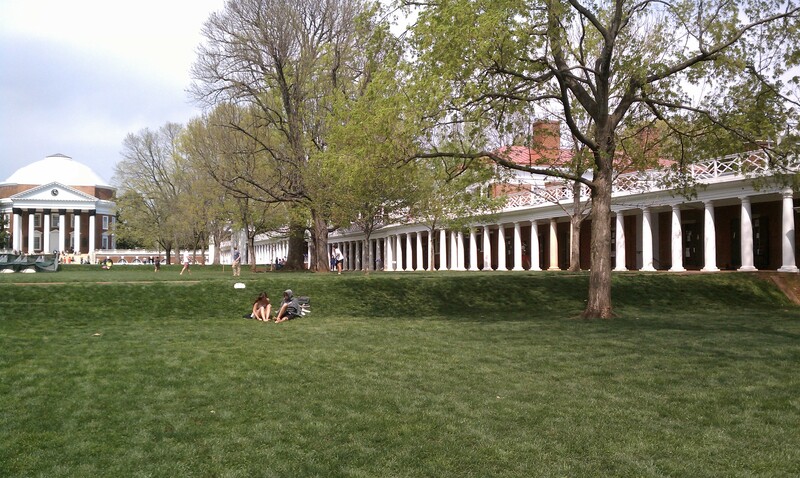 First up, the campus of UVA. 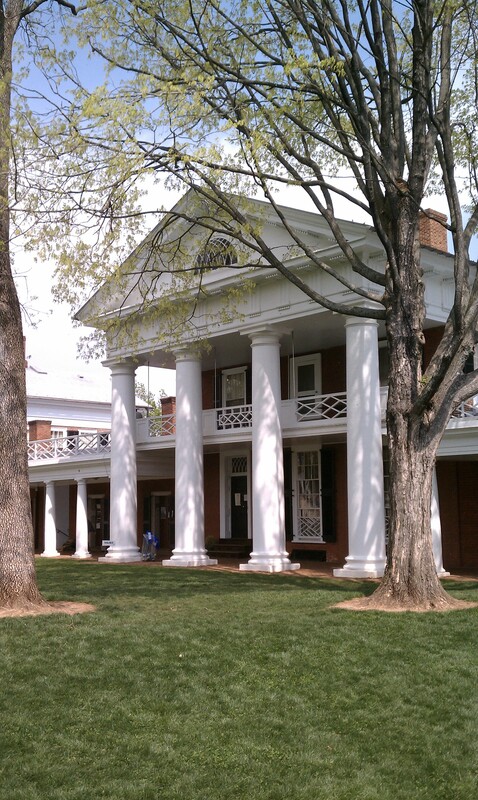 Designed by Jefferson in the early 19th century, the first cornerstone was laid in 1817. The layout is of the main bulding – the Rotunda – at the top of the lawn, with a long quadrangle leading down the hill. The main lawn is flanked by arcades behind which are student dormitories, with the facade surface regularly interspersed with buildings called pavilions. The variations on these pavilions provide interest to what could have been too much repetition, and the individual designs allowed Jefferson to flex his muscles and try different elements of architecture and ornament. A view up the lawn to the Rotunda. The staff was setting up the risers for graduation, so I could not get a great shot of the Rotunda itself. The dormitories open right onto the lawn. With my visit in mid-April, there was much student activity although they must have been getting ready for finals. Door were open and just looking into these coveted, hallowed spaces really gave a sense of the history and community on the quad. 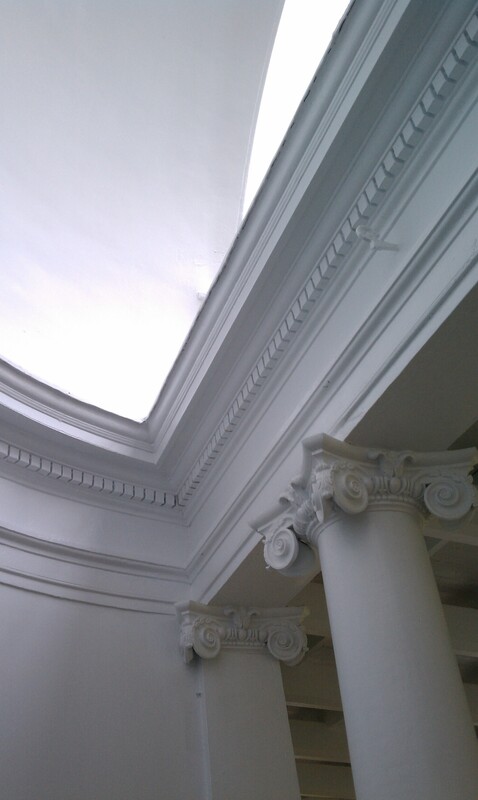 This pavilion detail shows a very interesting half-dome which brought in a lovely quality of light to the entryway. 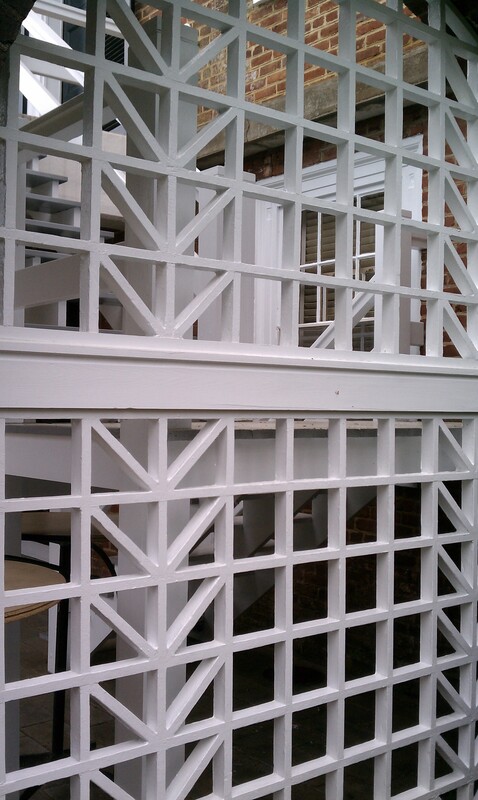 Near this pavilion was a facade which was painted in the original “buff” color; not a stark white. 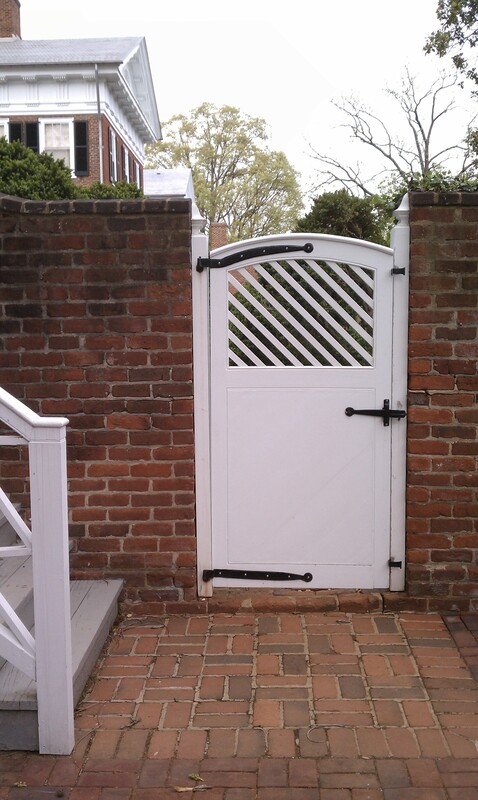 Its hard to believe the wood elements of UVA were originally the buff color but as I understand, Jefferson desired the ornament to appear as stone. Perhaps the amazing quality of light of this entrance element would not be as astounding in the buff, but I’m sure Jefferson’s intentions were well understood at the time. Walking around the back side of the main quad buildings brings some surprise and delight. The ground slopes away and some lovely gardens and landscape features await your every turn. One element that I had read about and needed to see for myself were the 1 brick-thick serpentine garden walls. These were enchanting. As with the front facades, each pavilion has a completely different rear face. Each rear garden was different too; some were divided into neat flower beds, some were more woody, some with meandering paths. All of the architecture is in use today for the university. I noted the comings and goings of staff and students through every type of door and stairway. 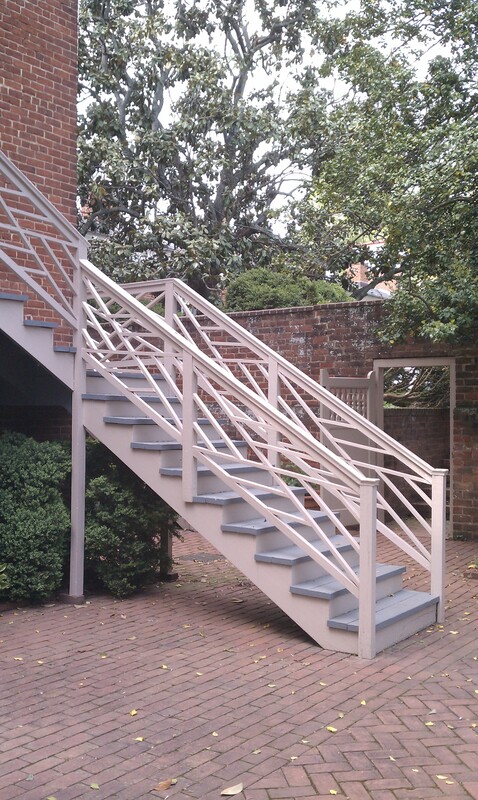 This back entrance – possibly even a lowly fire exit – was adorned with a great railing of almost modern design. A detail of an adjoining privacy screen shows some lovely Greek proportioning. This level of craftsmanship would not be easy to duplicate today. I just rambled through the gardens, noting the great plantings and variations on each building. Going through these garden gates as a visitor made me thankful the grounds are public, free for anybody to wander through and enjoy. 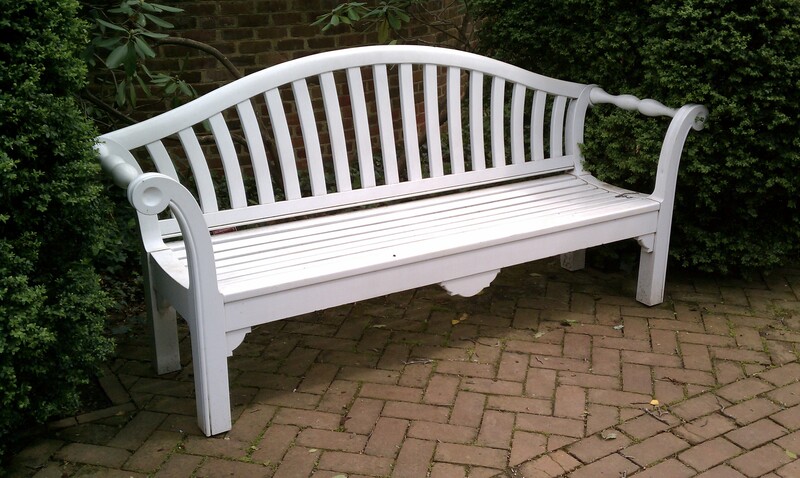 Even the garden benches, painted the same brilliant white, were enchanting. There were many types but this curvaceous number caught my eye the most. 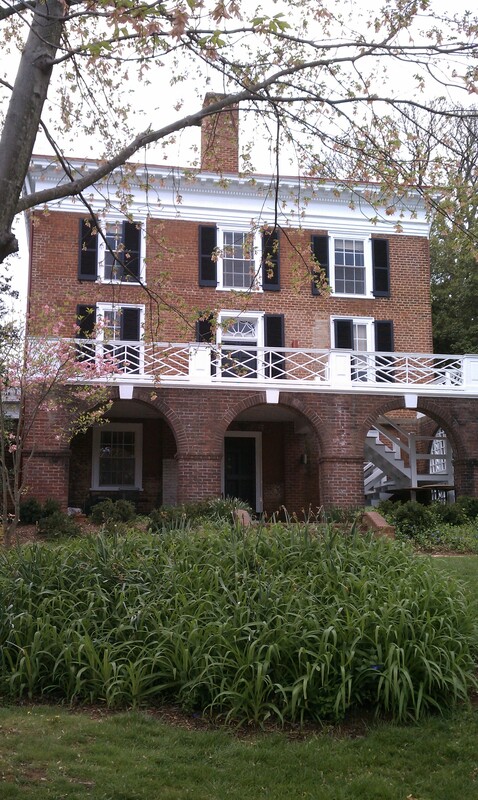 I recommend a visit to UVA for anybody traveling through VA. Of course, one must visit Monticello as well. 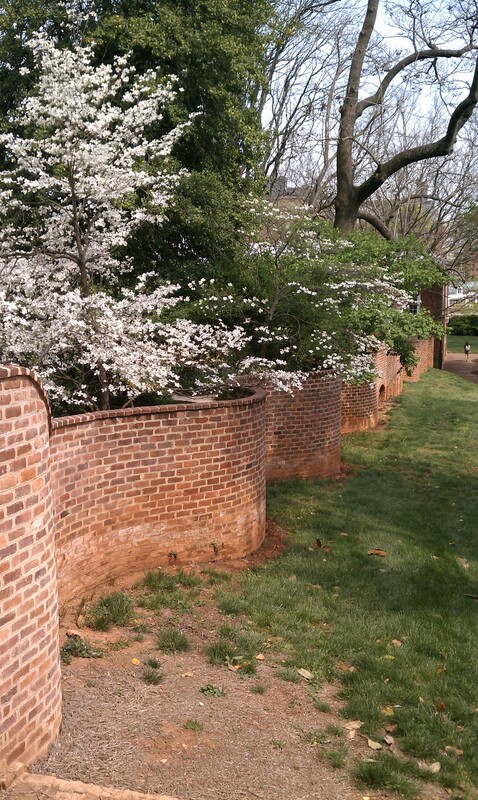 My next post will highlight Monticello and ruminate a bit on Jefferson’s life.